Federation for European Storytelling (FEST), which represents many European countries and many storytelling traditions, consider the Grimm fairy tales a part of our common cultural heritage. FEST specifically calls for their celebration, especially since Kinder und Hausmärchen (KHM) was first published two hundred years ago. To celebrate both the well-known and less well-known Grimm tales and all their distant cousins in other European storytelling traditions, participants of Project Grimm created a game producing online video using the KHM numbering of their 211 tales collected. There's even a video with an interpreter for Austrian Sign Language...see how many "natural" signs you understand! Our family uses American Sign Language and enjoys learning the sign differences for other countries. In mentioning Austrian Sign Language, I imagine the fun coming from the many languages used to tell these tales. Watch Rapunzel in a language you don't know and see if the teller still helps you follow it. Catch a story in a European language you are studying. The Project is international entertainment. So far, the most popular stories are: Rapunzel, The Three Spinners, Mother Hulda, Rumpelstiltskin, and Cinderella but that may change in the course of the project. Also each participant is assigned two tales beyond the two chosen by the storyteller. There now is also an official Facebook page at http://www.facebook.com/projectgrimm with more videos uploaded all the time. The first volumes were much criticized because, although they were called "Children's Tales", they were not regarded as suitable for children, both for the scholarly information included and the subject matter. Many changes through the editions – such as turning the wicked mother of the first edition in Snow White and Hansel and Gretel to a stepmother, were probably made with an eye to such suitability. They removed sexual references—such as Rapunzel's innocently asking why her dress was getting tight around her belly, and thus naïvely revealing her pregnancy and the prince's visits to her stepmother—but, in many respects, violence, particularly when punishing villains, was increased. In 1825 the Brothers published their Kleine Ausgabe or "small edition," a selection of 50 tales designed for child readers. This children's version went through ten editions between 1825 and 1858. The Wikipedia article lists the KHM number and title of all tales, plus listing those omitted from the final edition. Titles may differ from what you recognize as translations vary. British storyteller in Germany, Richard Martin, helped me learn what 50 tales were considered appropriate for 19th century children. Here are the KHM numbers and you can check them with Wikipedia: KHM 1, 3, 4, 5, 6, 7, 9, 10, 11, 13, 14, 15, 19, 21, 24, 25, 26, 27, 34, 37, 45, 46, 47, 50, 51, 52, 53, 55, 58, 59, 65, 69, 80, 83, 87, 89, 94, 98, 102, 104a, 105,106, 110, 114, 124, 129, 130, 135, 151, 153. It's interesting to see what famous stories are included and what are omitted. For example, Hansel and Gretel are in, also Rumpelstiltskin. Rapunzel is out, but also The Elves and the Shoemaker are missing. It includes many unfamiliar tales, which is exactly why the Project Grimm exists. The Wikipedia article's added features include a tab labelled Talk for added views of the topic. To research folklore use an external link to Aarne-Thompson Tale Types on D.L. Ashliman's excellent website, matching Grimm stories to familiar themes. 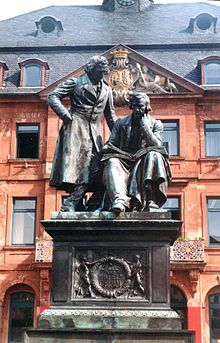 Another Wikipedia article is also referenced about the German Fairy Tale Route -- a German tourism project of various locations important to their work, established in 1975, in case you visit Germany. With all the current attention on fairy tales in movies and television, I side with both the Fairy Tale Lobby and FEST in seeking to promote fairy tales for all ages, yes, including adults since these tales were never solely intended for children. Jakob and Wilhelm knew this and so do you.